Like in the last post on rediscovering Kantha ,today I'll show you two more stitches commonly used in Kantha. Last time we talked about four stitches/techniques - Jod,bejod,Dhaner Sheesh and Tara Butti. In this post ,we'll get introduced to Paichano and Kantha Butti. Usually Kantha butti has five petals and is stitched from the outside to inside as running stitches.The centre is optional. See the incomplete one - I started long running stitches from the outside and gradually decreased as I move towards the center. 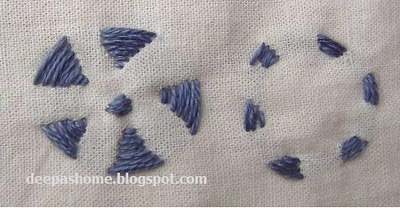 Paichano is nothing but laced running stitch.See the picture below. Kantha embroidery is usually done with 2 or 3 strands of cotton threads.Earlier the thread used to be pulled out from the cloth itself and used for embroidery. There are a few more terminologies to be understood and documented. A kind friend has agreed to share some documents she has about Kantha. Once I get them, I'll try to share some more information about this exquisite art and may be show a worked piece. Meanwhile,you can see a lot of Kantha terminologies and borders in this article about Nakshi Kantha . You can also read about Surayia Rahman ,an extraordinary artist and see her works in the links provided in this page . Thanks to Anil Advani for pointing out this link. Deepa...so nice of your to share all these information. thank you Deepa for the `post and links! You always make such valuable posts! Hugs. Thank you Deepa not only for this embroidery rutorial but for all the tutorials and hints you give us about embroidery. I have learned a lot from your blog about deifferent kind of embroideries. I missed you when you were unable to blog for a while.